Hello my dear readers how are you all today? My life has been a series of changes and relocations. My family and I moved out to the prairies in the middle of Canada 4 months ago. We’ve been adapting to the climate (it’s drier and colder here) so the cold and flu season has been wrecking havoc on our immune systems. We’ve had an early snowfall and it just keeps coming by the bucketfuls. As I’ve been making my house a home I’ve also been advocating for educational services for my youngest son with autism. That has been a journey I’ve been on since he was a toddler and one that can leave me elated and depleted all at once. The intervention therapists in this school district do more assessments then hands on work with children. Which is something I’m not used to as my son had a wonderful team at his previous schools. My son has a wonderful teacher, educational aide and special needs education resource teacher. The Occupational, Speech and Language Pathologist and Physio therapists all work on a consultative basis. They put together a written plan and then the aide and the resource teacher implement it. They’ve started using visuals in the classroom which are a great support for my son. He needs to see those pictures in order to process what he needs to do for his school day. He’s been doing well as he’s a more visual than auditory learner. There’s also been a few hiccups which means I stay at school and help him and his aide work through it. He will become overstimulated in an environment that is noisy and will react by stimming (running, yelling, spinning to get sensory input) His central nervous system will go into sensory overload as his Sensory Processing Disorder causes a traffic jam inside his brain and nerves while he’s processing all the input. Then he needs help immediately to help him cope while nerve impulses are firing off inside his brain. I’m a team player I will do what I can to assess and alleviate the situation and then tag his aide to carry on. It’s so hard to leave my sweet boy when he’s in conflict with his environment and senses yet I know he’s in great hands. I will be relieved after the consultations are done with the professionals and he can start his therapies. He’s been working with his resource teacher and aide on an ongoing basis but to have a Individual Intervention Plan (IIP) will help us all. I continue to support my oldest son with his school and hockey. He loves his new teacher and is making friends and fitting in well with his student led classroom. I’ve had an opportunity to meet with his teacher and attend some games and practices and meet some of the other parents. I take my hockey Mom role to heart and cheer my son and his team on and off the ice. Yet I’m split in the middle as I have to be aware of how his little brother is reacting to his environment. If it’s too loud, busy and confusing then a sensory meltdown is forthcoming. I call it the Mom pie syndrome everyone gets a piece then I bake a new one for the next day. Lately I’ve been finding that I don’t have a piece left for me so I need to take my self care into account. I want to be more social yet I deal with my anxiety and tend to shy away from initiating that. As someone who has both the mobsters of self worth and self esteem knocking on my mind’s door depression and anxiety take the drivers seat while I’m the passenger along for the ride. It’s a vicious cycle I live with and keep on persevering through it. Taking steps slowly and surely is the key to my social success. I’ve done the opposite and have crashed on through like a proverbial bull in a China shop and suffered the after affects. We spent our first Halloween in our community and I got to meet a lot of my new neighbours. Everyone was kind and welcoming and I felt a surge of feelings of relief when I engaged with them. It’s amazing what cute kids and all of us in costumes will do to raise my confidence. This year I was a pirate, my oldest a Pumpkin man complete with a suit, top hat, sunglasses and a cane. My youngest was a skeleton complete with a head mask and my husband was a Spider man complete with a suit and a skull top hat. We take turns every year one to stay home and hand out candy and the other to go trick or treating. It was my turn to go out with our sons, even though it was cold they collected quite a haul of candy as we introduced ourselves to our neighbourhood. Every year we decorate our house and yard as we’re big fans of Halloween and fun ensues as my family tries to out scare each other . The day after the snowfall happened and I was rushing to get decorations inside the garage before they fell apart! I accomplished my task and then shovelled snow until I couldn’t feel my hands and feet then I spent the afternoon underneath my electric blanket till school was out. As I continue to unpack and organize I also have been decluttering. This is not an easy task for me yet a necessary one. I’ve given away more boxes to the thrift store that I’ve made a new friend there! I’ve thrown away broken toys, picture frames, paperwork and junk in the last two months than I have in my whole life! I want to live my life more simply and being clutter free is the first step to that happiness. Family is my cornerstone in life- they guide and teach me as much as I do with them. With each move, new home and the changes of scenery the one thing that’s constant is our loving bond. Sadie looked wistfully out the window from her comfy chair dreaming of the day she could ride the horses in the field at her neighbours farm. She knew that the brace she wore to correct her twisted spine from scoliosis would impede her riding ability. She cursed that wretched brace but was grateful for it as well so that she could walk properly. Without it she would be sidewinding and shaking up the tumbleweeds like a rattlesnake. He knew of her love of horses and looking skyward he sent up a prayer that one day she would ride one. A month ago I embarked on a journey to pack up my truck and my kids and headed out on a new adventure. My husband has been working away for 3 months and after solo parenting, recovery from a broken arm, and listing our house for sale I was done! I counted the days till my kids were out of school and got out of dodge. Once we arrived tired, sweaty, and dis regulated late at night that&apos;s when the real fun began. It was a long trip and after listening to my kids nit picking each other for 7 hours. I arrived disheveled and I needed a time out. I love my children but I was "needed out" and wanted to forget my name was Mom. But who would answer if I don&apos;t? My husband was off limits as he was attempting to sleep with working the next day. I went into action mode and set up the pullout couch for the kids. I jumped into my pyjamas and crawled into bed. My youngest son was stimming and in need of sensory input and regulation so we needed to fill that asap! I walked around the hotel and read books and gave him deep pressure hugs that only his Mama can give. Inside I was praying for him to go to sleep as he jumped out of my lap and rolled around on the floor. I felt the need to explain to the front desk hotel staff that my son has autism and not able to follow the quiet time rule after 10 pm rule. He gave me a nod of understanding and I carried on with my regulation methods. Finally by midnight my son was sleepy so I put him to bed. Meanwhile my brain was on hyper drive as the events of the day piled up and reduced me to tears. I lay there on the cold bathroom until my crying subsided then fell into bed into a deep sleep. I woke up in the morning feeling like I had ran a marathon then someone had run me over and left me for dead. I needed to eat, shower, brush my teeth, and unpack. Breakfast was complimentary and a Godsend. My youngest son was fascinated with the pancake machine as he pushed the button an they fell onto his plate. Thank God for these little gifts as this held attention long enough for us to get through breakfast and back to our room. Swim daily and spend as much time there as you can in order to wear your children out. That includes numerous trips to the water slide and to the hot tub. Water can have a regulating affect on children with sensory disorders if there&apos;s no Sensory Defensiveness present and they&apos;re comfortable being immersed in a pool. Invest some time in the gym. I go there weekly with my kids to work out. Even at the ages 10 and 6 there&apos;s machines they can use like the treadmill, elliptical, spin bike, and free weights. It&apos;s a wonderful way to feel healthy and deal with stress. Provide sensory friendly cut up fruit and vegetables for snacks. The crunchy foods provide the sensory seeking benefit as well as toning the jaw muscles. With my sons hypotonia condition in his jaw this is a huge benefit to his sensory diet. Cut back on junk food for snack time. My kids tend to be sponges for everything they absorb like sugar and food dyes. Trust me you don&apos;t want a sensory overloaded mind and body meltdown within close quarters in a hotel room! In one word Netflix plus additional DVD&apos;s, colouring books, crayons, felts, wipe board books, and washable markers on those inside days when you&apos;re too tired to move. Maintain your children&apos;s sensory diet even while on vacation. Move as much as possible explore your local parks, playgrounds, and the city itself. On days when the weather&apos;s miserable have board games, puzzles, crosswords, and structured time on electronics. I stress this one as you don&apos;t need to struggle with the affects of a dopamine crash after a limit is not followed. 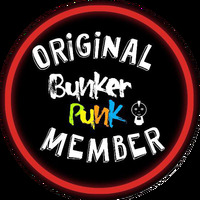 We also signed up for the Kids Bowl Free summer program and that&apos;s fun for the whole family. My kids became very creative through the pleas of I&apos;m bored and built themselves and indoor bowling alley that kept them entertained for a few hours. They also did some crafts, painting, and worked on maintaining fine motor strength playing with thinking putty and play dough. Our favourite thing to do is play make believe as they pretended they were superheroes and the world was being covered in lava. I watched my kids jump from bed to bed and marvelled at their imaginations. After a month of hotel living I&apos;m confident I made the right choice to reunite as a family. I wanted my kids to have a fun summer instead of being stressed about keeping a clean house for showings while attempting to sell. Now I spend my spare time reading, writing, organizing housing information and counting off the days till our new homes possession date then the fun starts again with packing and unpacking. Whatever comes our way we&apos;ll get through it as being together as a family is the best place to be. It’s been almost 1.5 years ago that my youngest son was diagnosed with autism and a rare neuro developmental disorder called 16p11.2 proximal duplication. Which makes him so rare is that not all 16 th chromosomal abnormalities develop into any other genetic anomaly and in some cases it does. He’s in the 1 % where the duplication develops into autism affecting his central nervous system, auditory system, visual system, as well as his sense of taste and smell. Essentially the disorder means that he has an extra band of DNA in the 16 th area of his chromosome. We all have one individual band on each side of our long and short arm of our chromosomes. In my son’s case he has 3, one on his left arm and 2 on his right. All this extra genetic material can manifest into other disorders such as ADHD, ODD, OCD, and mood disorders such as bipolar depression, schizophrenia, and learning disabilities. My son can also be affected medically with auto immune disorders, spinal growths known as chiarri and a possibility of tumours. I just learned of his diagnosis almost 1.5 years ago which led to the diagnosis of autism level 3 stated in the DSM 5. Which means he’s needing substantial support for resistant and persevasive behaviours. I will admit when I heard his pediatrician give his diagnoses I cried and I shook so hard that I fell off my chair! I completely lost control while the doctor said she was sorry over and over again. What was she sorry for? Her world didn’t change in an instant? This is my first time writing about it as I had to process it. In the meantime I’ve gone into my “Mom research mode” and learned more of how to help my son. I recently met with a geneticist for counselling and she provided me with some more information. She was impressed that I was aware of so much already. I was left on your own after my son’s paediatrician left her practice so I didn’t have a choice. I’ve always referred to my son as my SPD (Sensory Processing Disorder) Superhero now he’s my champion. I never knew what his life would hold for him as I held him in my arms when he came into the world. He was a tiny 6 lb, 2 oz bundle of joy with a fighting spirit. Now he’s grown into a strong, independent, precocious, fun loving, six year old boy. He has had a lot to contend with in his young life. Along with his autism and rare diagnoses he also has other disorders. For eg: First, Then, and After. Which helps him process things better with his executive functioning skills. He also has asthma and Obstructive Sleep Apnea that’s controlled with medication. He’s a sensory seeker and has sensory processing disorder, in particular Sensory Modulation Disorder. He can’t spin in a circle in one direction for too long as it overstimulates his vestibular sense. I have to make sure he spins clockwise and counter clockwise or he’s crashing into walls and people. When he was a toddler I used to have to duct tape a body pillow to the wall so he wouldn’t injure himself! His proprioception sense is weaker so I use a lot of visual spatial concepts and cues to help him understand. He gets very visually overstimulated so I use a white board or visuals to help keep him on task. He’s also wearing his glasses in school to help with that. He has also completed a one year developmental therapy contract having a Behavioural Aide and psychologist working with us in our home. As well as an Educational Aide at school and a Community Aide to help with the social and behavioural aspect. We use a white board inside and outside the home using the first, then, and after sequence of events. We visual cues (tapping body parts), stating the name of each body part in motion, and crossing the midline, and using visual pictures. My son responds very well to all the above as well as repetitive speech. I’ve seen him struggle with leaving the house to happily going on an adventure. Every Dr’s appointment, geneticist visit, hospital checkup, and ride to school is an adventure for him. The reason why is because I make it this way by using social stories, sentence strips, and role playing to help him motor plan and process the visual and auditory information. We work diligently to not overwhelm or overload him sensory wise. Our life isn’t easy by no stretch of the imagination but it’s manageable and we share love, laughter, learning, and joy. From the first time he opened his eyes and looked at me I knew it would be him and I against the world. Now with support, education, awareness, and acceptance we’ve found our special needs village and for that we’re grateful. Welcome to the Voices of Special Needs Blog Hop. 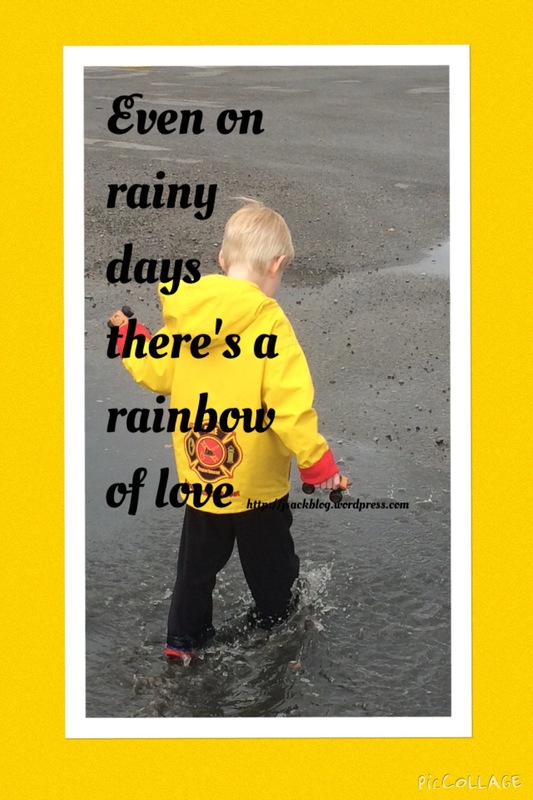 A monthly gathering of posts hosted by the Sensory Spectrum and Jenny Evolution. Click on the links below to read stories from other bloggers about having a special needs kiddo. From Sensory Processing Disorder to ADHD, from Autism to Dyslexia! Want to join in on next months Voices for Special Needs Blog Hop click Here. Gone-your voice that used to fill the room with laughter echoing off of the walls is gone. Never to be heard again, or feel that warm energy emanating from your soul. Gone- to live a new life amongst the angels, free of worry, pain, and the strife of the worlds sorrows. There&apos;s nothing more but my memories to hold onto and squeeze all the joy and happiness from until it&apos;s a worn out rag. Gone- 3 deaths in a space of 5 long grief filled weeks, how much more can my poor broken heart take? Every loss reminds me of my own loving parents and Grandparents. Who taught me to be strong in the face of adversity and face my challenges with an iron fist, and to smash any obstacles that stood in my way. Gone-the beauty of the storyteller forever silenced and only the loved ones to carry on those tales of family tree origins and how we came to be from our ancestors. Your words that still echo in my ears to this day. While I come to terms with the final goodbye. Gone- I look to the stars watching for a sign from you to let me know you&apos;ve made your journey to be with God. Are you dancing in heaven with a spring in your step from cloud to cloud or singing with the angels chorus of glory and exaltation? Gone- to sit on a cloud and not only ponder lifes meaning but to truly find it and realize how much you were trapped on earth in the vessel known as your body. Gone-While I feel the need to express how in your body you were somebody special to me. Never will I look upon your face feeling that kindness when I looked at your smile. Never will I look into those sparkling eyes that held wonderment and mischief of a joke you were wanting to tell. Gone- to a place amongst the clouds to learn, laugh, and love again while I sit her trapped in my melancholy mood. Seeing your loved ones and being reunited with a heartfelt love of gratitude that shines brighter than a thousand suns. Gone-from this earthly plane and lighting up the heavens, but not from my heart. No one will take your place in my dreams, prayers, and aura. Gone-One thing that will always remain is my love for you as steadfast as the mountains. Life has to go on even when I don&apos;t want it to. Could the earth stop spinning long enough for me to recover? Gone-the memories are a comfort at this woeful time yet I&apos;d trade them all in to hear your voice saying how are you. Gone-Is the gift our friendship and the special nickname you had for me. I will go on, time will pass, yet it won&apos;t heal my gaping wounds. Gone- I&apos;m not ok, fine, or feel the least bit that I can cope with so much loss. As I sit here in the dark pouring out my heart. I&apos;m crying now and bleeding tears of anguish and pain. Gone-There&apos;s so much more to say, to write, to spin into poetry. But I&apos;m tired of holding up this armor that I&apos;ve put around myself. To protect me from lifes cruelties and another possible death. Gone-I will have my love and admiration for you until I breathe my last breath and see you again. Gone-You&apos;re my favourite hello and my saddest goodbye. There are mud puddles all around as I step gingerly around them not wanting to get my new Ugg boots wet. The sheep lining encompasses my feet making me feel such coziness. As I tip toe across the plethora of puddles I glance at my reflection. I look so sad as the tears start to glisten in my eyes. I think of my sweet Mama and her saying “this too shall pass remember there’s always pain, but the sun shines after the rain.” I smile as I wade through the murkiness of my emotions and see the rainbows reflection. This is my contribution to The Carrot Ranch flash fiction challenge. If you’d like to participate keep on reading! February 9, 2017 prompt: In 99 words (no more, no less) write a story about a rainbow in a puddle. Is it a silver lining of sorts or a false reflection? Think about what it might mean or convey. Simple science? Hope? Or the doom of humankind? Create action or character reflection. Go where the prompt leads you. Respond by February 14, 2017 to be included in the compilation (published February 15). Rules are here. All writers are welcome! Veva Matron is a feisty girl raging with suppressed anger and distrust of men. Solis Cronus is a blindingly beautiful, Greek god of a guy, who likes to play women. An electric hatred thunders through each of them about the other until one night, lightning strikes. A world of secrets reveals the destiny of two at odds with one another, and clouds the line between love and hate. 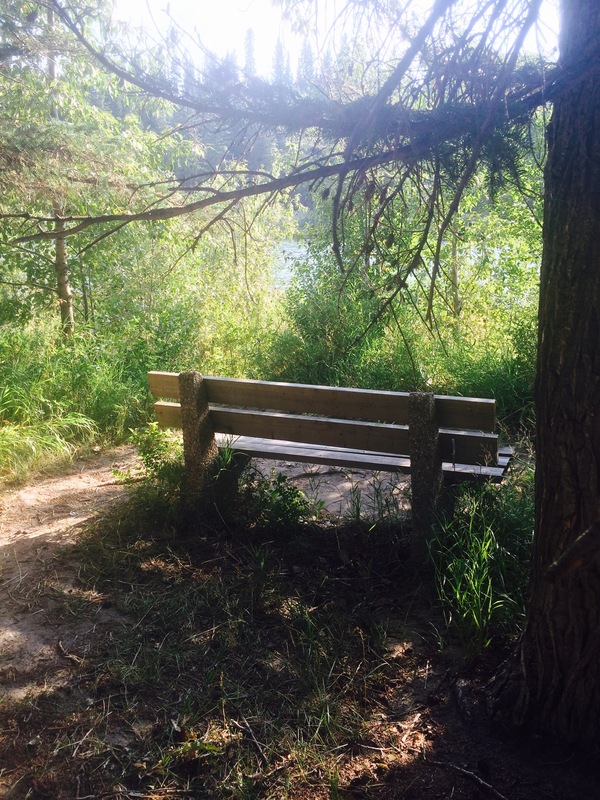 Can a lively girl find calm in the stormy tension of a boy made of sunshine and sin? The mythical tale of Zeus and Hera reignites in this modern interpretation of enemies to lovers. 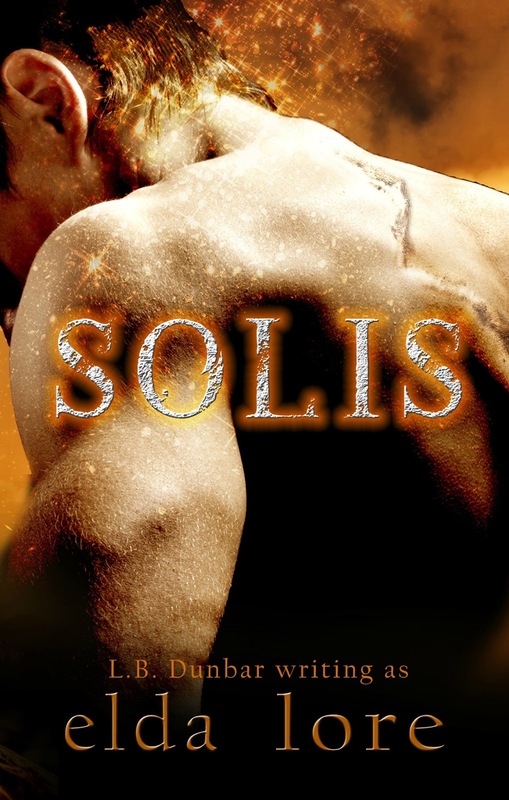 Full of flirty sexual angst and teasing temptation, Solis might be the one man who can extinguish Veva’s angry fire and ignite a different sort of flame: desire. 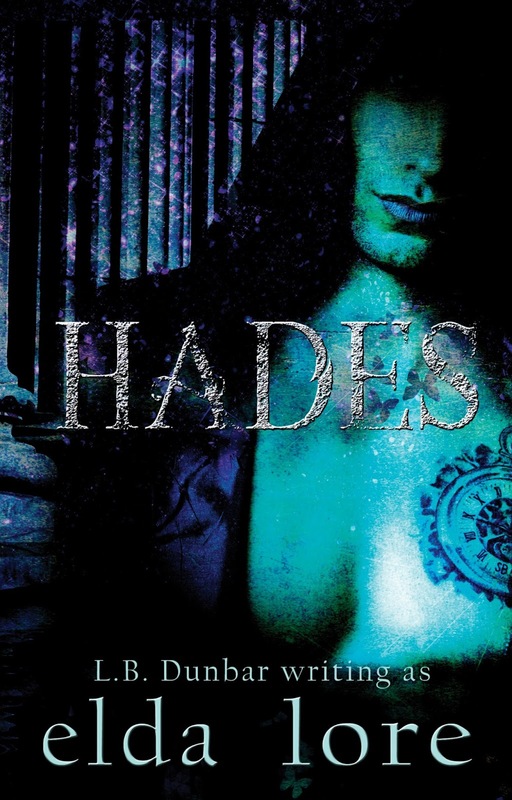 I have to share my heart was captured when I first read Hades by LB writing as Elda Lore. She took my love of Greek Mythology and the supernatural and turned it into something magical for my eyes and ears to experience! I was eager to read the continuation in Solis and soon fell in love with the book’s new characters. I love a strong female character in whatever genre I’m reading. Seeing what made Viva tick and how her upbringing left her jaded towards men made me feel a kingship with her. Before I met and fell in love with my husband I felt this way myself. She always preferred to be the heartbreaker than being heartbroken. 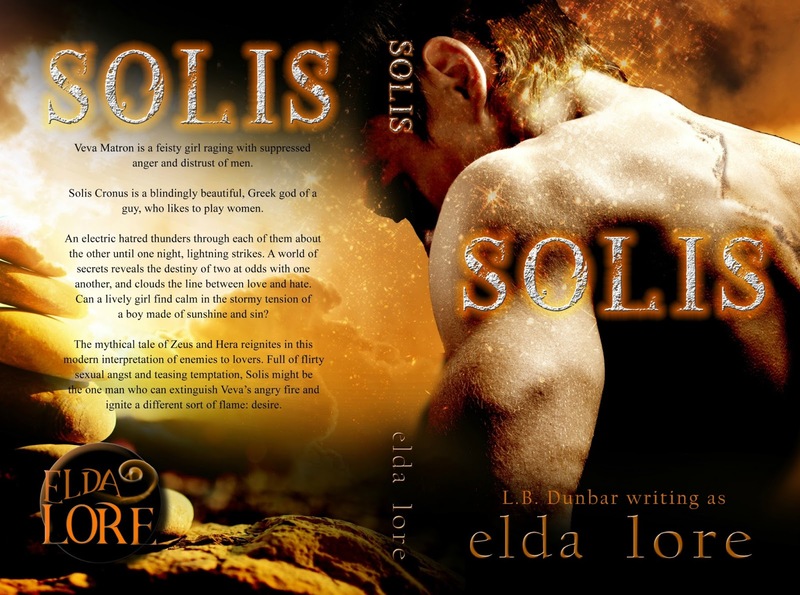 Then along comes Solis Cronus who’s a gorgeous blonde Greek God who exudes sexuality and confidence. She has no time for him as her main concern is enjoying her summer break with her best friend Persephone. Who’s heartbroken after her love Hades returns to the Underworld without her. The story of the Modern Descendants flows beautifully from the introduction of Solis and his family to the conclusion of who will fall in love, lust, or out of Zeke Cronus’ good graces. Secrets, love affairs, mythology, and modern times mix together to entice the reader and leave them eagerly awaiting the next sequel to the Modern Descendants series. I loved this book and look forward to losing myself in the next adventure of Hephateus coming soon. She was chilled to the bone when she put her key in the lock. Her hand was shaking so badly she nearly dropped it. Finally she was inside and desperate for warmth. Hurriedly she got out of her coat and winter boots placing them carefully in the closet. Even though she was frozen to the core her OCD behaviours reared their impertinent head. The fire crackled and outside the wind roared against the window pane. She was safe, warm, and cozy sipping her tea she let out a sigh- hygge. She heard the laughter of her late Danish Grandma. This is my contribution to the flash fiction challenge at Carrot Ranch hosted by Charli Mills. I loved getting the creative juices flowing through my fingertips. Yet I found it difficult to stop at 99 words. Nothing like some creative writing to smash up a block in the brain!